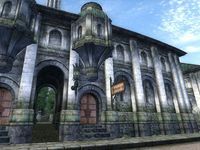 The Merchants Inn is an inn located in the Imperial City's Market District. It is found across the street from Jensine's "Good as New" Merchandise and next to A Fighting Chance and First Edition. The establishment lives up to its name, as many of the merchants from the Market District come here after their shops close. The publican, Velus Hosidius, buys potions and food while only selling the latter. Nilphas Omellian can also be found here with the Fighter's Stronghold official plug-in; he sells the Battlehorn Castle upgrades. The ground floor contains the main reception area and the dining room, the rooms are upstairs, and a basement serves as storage below. 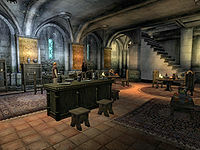 The main large reception counter near the front door holds nine bottles of mead, four bottles of cheap wine, two bottles of Surilie Brothers Wine, and a non-respawning lectern that holds clutter. On the southwest wall behind the counter sits a drinks cupboard and a set of shelves that hold a pumpkin; a pair of oiled linen shoes sits nearby. On the southeast wall, a set of shelves holds five potatoes, two pumpkins, two watermelons, two leeks, and two heads of lettuce. Nearby a barrel holds food and two non-respawning sacks hold clutter. On the northeast wall, a food cupboard sits alongside beside a bench in front of a table holding three apples. The closest round dining table is set with two loaves of bread, a cheese wedge, a cheese wheel, three bottles of ale, and a bottle of cheap wine. The table closer to the door to the basement in the western corner is set with three tomatoes, two potatoes, two carrots, a loaf of bread, a cheese wedge, and five bottles of cheap wine. The door to the rooms lies at the top of the stairs. There are three rooms along the hallway on the upper floor of the inn. 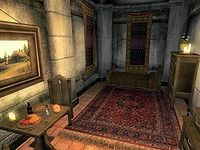 The first is the one used by the player when a room is rented. An empty cupboard sits in the southern corner, and the double bed lies in the eastern corner. An alcove in the northern corner holds a clutter desk and an empty chest. The table in the western corner is set with three potatoes, three radishes, two ears of corn, two pieces of venison, two bottles of mead, and a bottle of beer. The second room holds a chest of drawers that contains clutter in the southern corner and a cupboard with the same contents in the eastern corner. A single bed lies in the northeast end of the room. The table in the western corner is set with two potatoes, a loaf of bread, a piece of venison, a bottle of mead, and two bottles of skooma. 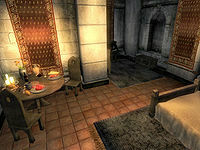 The last room is occupied by Nilphas Omellian with the Fighter's Stronghold official plug-in. A cupboard in the southern corner and a chest in the western corner both contain clutter. A single bed lies on the northwest wall, and the table in the alcove at the northeast end of the room holds three radishes, a potato, a piece of venison, and a bottle of mead. A barrel sits on the first landing of the stairs leading down into the basement, and at the foot of the stairs another barrel and a sack sit on top of a crate. Three more barrels sit in the north corner, along with another two and a second crate in the west corner. A final barrel lies in the south corner. The two barrels in the west corner hold food, while the rest of the containers in the room all hold clutter. The single sack is the only container that does not respawn. There is a substantial amount of food in the room that becomes available for free if you pay for the night. Esta página foi modificada pela última vez à(s) 06h29min de 6 de julho de 2013.